Biodynamic viticulture seeks to avoid the use of chemicals by encouraging the development of a healthy soil, supporting a well-balanced growth of the vines, and preventing diseases using natural methods such as the biodynamic preparations and plant teas/decoctions. While helping to form a fruitful and healthy plant, winter pruning can leave the cut stem prone to infection and a pruning paste is one way of sealing this wound in a natural way. The ingredients may not be to everyone’s taste but this recipe, adapted from ones by Monty Waldin1 and Vincent Masson2, does form a satisfyingly thick gloop. In this recipe the equisetum tea and tea tree oil have anti-fungal and anti-bacterial properties, the clay causes the mixture to stick and stay on the cut even in the rain, while the manure gives volume when combined with the clay. Rudolph Steiner also made the observation that the trunk/stem of a woody plant is more strongly connected with the soil than the air, and should be treated in a way that supports this – for example coating it with a manure/earth paste 3 . Begin by making the equisetum tea by simmering dried (100g) or fresh (1000g) equisetum Equisetum arvense (Horsetail) in 5L water for 1 hour. This can be made the night before so that is cool before mixing. Take one measure of fresh organic cow manure and add the same amount of clay. Mix together. Add half the home-made equisetum tea and mix thoroughly in the bucket. Keep adding the clay until you achieve a thick slurry – like gloopy pancake batter. Add the essential oil, mix well and the paste is complete. 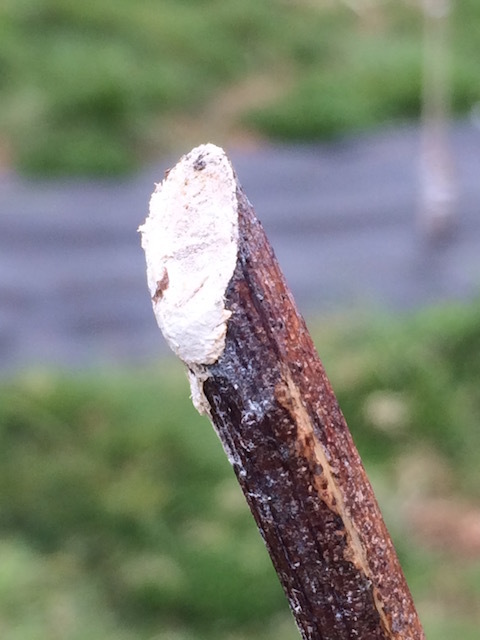 Paint the paste on each cut and around the end of the cane to create a well sealed cut, ideally directly after pruning. As our vines are still being trained into their final shape, we only had one cut per vine this winter making it a relatively quick process. We quickly settled into a routine with one person pruning and collecting the cuttings in a basket to be chipped and composted, while a second person followed on behind with a bucket of paste and a fat-headed paintbrush, daubing every fresh cut. Even after the recent heavy rains the clay content has kept the paste in place. We will post a follow-up picture later this year to see how the healing process went.